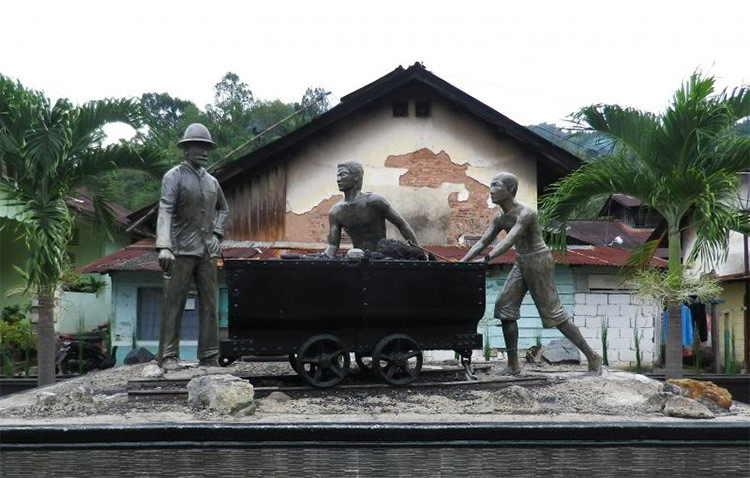 Mbah Soero pit mine is one of the historical attractions that located in Tanah Lapang, Lembah Segar, Sawahlunto, West Sumatra, Indonesia. This 185-meter long tunnel was built during Netherlands East Indies government, in 1898. From 1898 to 1932, the coal mining operations in Sawahlunto city was using this tunnel. However, for the purposes of tourism, local governments renovate this tunnel into the places worth visiting in terms of both security and ease of reaching the area under the ground to build stairs. The renovation began on June 27, 2007 until December 2007. Then opened as a tourist attraction on April 23, 2008. Its authenticity is still maintained, it can be seen from the roof and the walls that made of coal. To give visit to this site, the visitors are required to register and buy tickets at Info Box Building. In 1947; Info Box Building is Labor Meetinghouse and the place to held various activities, either any staff meetings to entertainment puppeters show after payday. Now, the building serves as an information center for Mbah Soero coal mining. After the helmets and safety shoes are mounted perfectly, the adventure down into the hole will begin. A guide will tell the visitors about the things that will be found inside and some of the rules and the restrictions that must be obeyed. Due to the high historical value, since 2007 the mine pit is open for tourists. In addition, there is also photo gallery and movie about the history of the mine. At the end of the visit, tourists who visit will obtain a certificate.